Charles S. Cohen, Chairman and CEO of Cohen Media Group, has announced that the landmark thriller THE OLD DARK HOUSE, starring Boris Karloff, will be released by the Cohen Film Collection on Blu-ray, DVD and digital platforms on 24th October 2017. The home video release features the dazzling new 4K digital restoration that was screened to wide acclaim at the 2017 Venice Film Festival. Based on J.B. Priestley's popular novel Benighted, this legendary classic was directed by James Whale in the fertile period between his Frankenstein and Bride of Frankenstein. 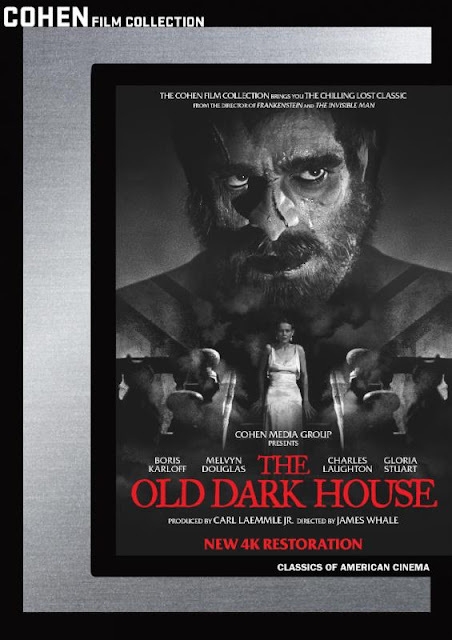 In THE OLD DARK HOUSE, Whale puts a surprising spin on horror film conventions even as he is creating them, adding black humor and sexual perversity that was eye-opening in 1932. A quintessential dark and stormy night brings a group of travelers to a forbidding mansion in the Welsh countryside, where they find themselves at the mercy of the strange, and possibly dangerous, Femm family. Boris Karloff is, as always, unforgettable, here playing a mute, menacing butler. The superb cast also includes Gloria Stuart, who would star in James Cameron's Titanic 65 years later, Melvin Douglas (Ninotchka, Being There), Charles Laughton (in his first Hollywood film), Raymond Massey (Abe Lincoln in Illinois, East of Eden) and Ernest Thesiger (Bride of Frankenstein). THE OLD DARK HOUSE continues to intrigue and delight audiences and critics. Jeffrey M. Anderson of Combustible Celluloid called it "essential Halloween viewing ... It's the ultimate haunted-house movie, and the ultimate spoof of them at the same time." Leonard Maltin called it "outstanding melodrama ... a real gem." Time Out London said, "Alongside The Bride of Frankenstein, [it's] Whale's greatest film, a masterly mixture of macabre humor and effectively gripping suspense." Bonus features on the Blu-ray and the DVD include: a new interview with Sara Karloff, daughter of Boris Karloff; the featurette "Curtis Harrington Saves THE OLD DARK HOUSE"; a feature-length audio commentary track by actress Gloria Stuart; a feature-length audio commentary track by James Whale biographer James Curtis, and the 2017 re-release trailer.